The BACON MANia Truck Serves Unabashedly American, Unapologetic Man-Food From A Fun, Friendly And A Little Bit Funky Nomadic Food Truck. Food Like You Wish Your Mom Used To Make, Cooked Fresh And Served Up With A Smile By The Guy/Girl Next Door. Our Affordably Priced Menu Is Always Changing As We Strive To Bring You Tasty Upscale Versions Of Your Favorite Downhome Dishes — Plus A Surprise Or Two Along The Way! 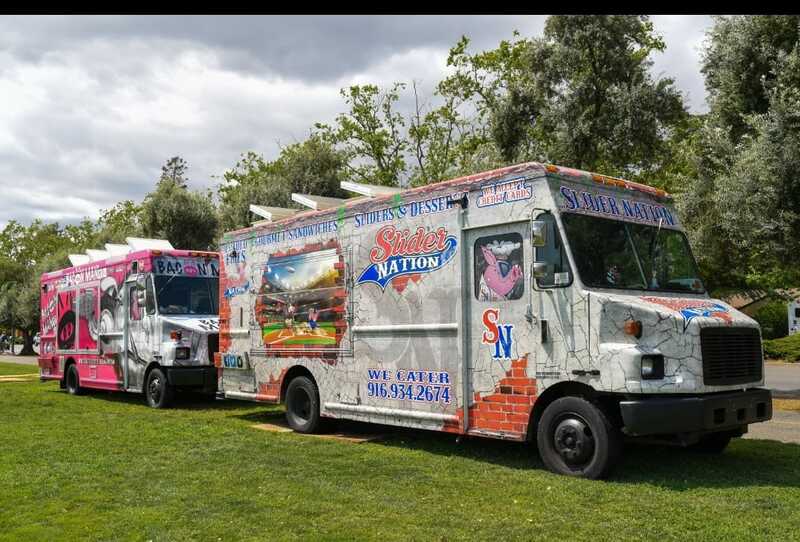 James Wheeler brought Slider Nation to Northern California in 2017 to add to the already stellar BACON MANia Food Truck Family. James and the team took all the knowledge they had acquired over the years running food trucks and rolled the different aspects into one home run concept. Serving Sliders with a sporting spirit and atmosphere that appeal to any crowd. Hefty Gyros is a family owned and operated food truck that serves delicious and great quality food. We offer authentic Mediterranean cuisine with Turkish, Greek and Middle-Eastern culinary influences. Our gyros, rice plates and falafels have an abundance of flavor; while our rich proportions fulfill your expectations with affordable prices. We pick the freshest halal meat and produce in order to serve you an unforgettable meal. Dawn Kado, being Sansei-Yonsei (3rd-4th generation Japanese American), grew up eating foods from recipes that have their roots in post-war Japanese/American and Hawaiian households. At an early age Dawn learned to prepare many of these recipes and has since developed the dishes that we proudly present to you. Been in business for 25 years and attend every kind of horse show including California High School Rodeos, team roping’s, Truckee rodeo, 4H shows and fairs. We serve a diverse menu featuring high quality food.